Summer tax bills are payable July 1 to and including September 10 without penalty. After September 10 please add one percent interest for September plus one percent interest the first of each month thereafter. December tax bills are payable December 1 through the last day of February. Should September 10 or the last day of February fall on a weekend the last day to pay is the following Monday. We accept U. S. Postmarks as date of payment. After February please contact the Mackinac County Treasurer at (906) 643-7318 balances due as well as additional penalty and interest. You may also look up taxes at the BS&A website ("Search Municipalities" > "Mackinac County"). However, payments are not reflected on this site until the Mackinac County Treasurer updates them the following March. 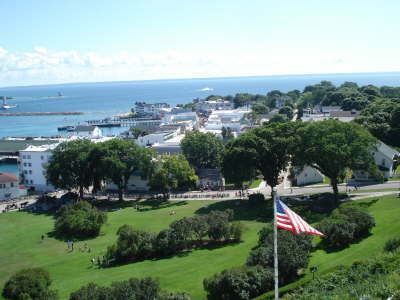 If Mackinac Island is your Principal Residence you may qualify to be exempt from some or all of the School Operating millage on your December tax bill. Your “PRE/MBT%” appears under the “Tax Detail” on the middle right hand side of your tax bill. To claim Principal Residence, please submit Form 2368 to the Treasurer’s office by November 1st of the year you wish to claim the exemption. We will need proof of Principal Residence, including driver’s license and voter registration. If you are claiming a Principal Residence elsewhere you will have to rescind (end) that exemption with that local Assessor by submitting Form 2602. All forms are also available at our office. Click here for the latest Guidelines for the Michigan Principal Residence Exemption program. You may also qualify to defer payment without interest or penalty of Summer taxes on your principal residence through the last day of the following February, the same final date as Winter taxes. This Form 471 must be filed prior to September 10 each year you wish to qualify for the deferment. The application must be approved or interest will accrue on outstanding Summer taxes due after September 10. The form is also available at our office. Please visit our Veteran’s Memorial Park located across from the Post Office, at the head of the brick walkway leading up from Main Street. One need not be a Veteran or a resident to be observed in the park! Engraved Memorial Bricks are available in two sizes. Each engraved line may contain up to 15 characters, including spaces. 4” X 8” bricks with up to three lines of 15 characters each are available for $50.00 and 8” X 8” square bricks with up to six lines of 15 characters each are available for $100.00. Please contact this office for an order form and any questions.